I wore this outfit to the bookfair last friday and some early-teenage kid behind me laughed at my yellow legs. When I was her age, I probably would have laughed too but still… Not nice kiddo! Besides her, I saw many (in)famous Belgians. It is annoying how many of our local actors and reality TV stars are writing books about themselves, their cooking skills or their “tips and tricks”. There were huge waiting lines for the 3 most watched TV cooks that signed their cookbooks all at the same moment, in the same room. One of them actually started talking to me last year. I was standing next to him while the boyfriend was picking out a cookbook. There was no one in his line back then and now there was a 45 minute wait line! Crazy what a primetime TV show can do for a man! I like the yellow leggings! That kid has no taste. You have such a beautiful blog! 🙂 And not to mention awesome style too! Love this outfit..the colours go perfectly together and the way you've wrapped that belt is brilliant! oh fun coloured leggings are the best! that kid doesn't know a thing. perhaps some day she'll find the joy of fashion. I love this color combination. I have similarly colored tights that I rarely wear, but you've definitely inspired me to give them a shot with this outfit. You look lovely. I like the yellow legs! Silly child, it's a primary colour they should love it! Great outfit. 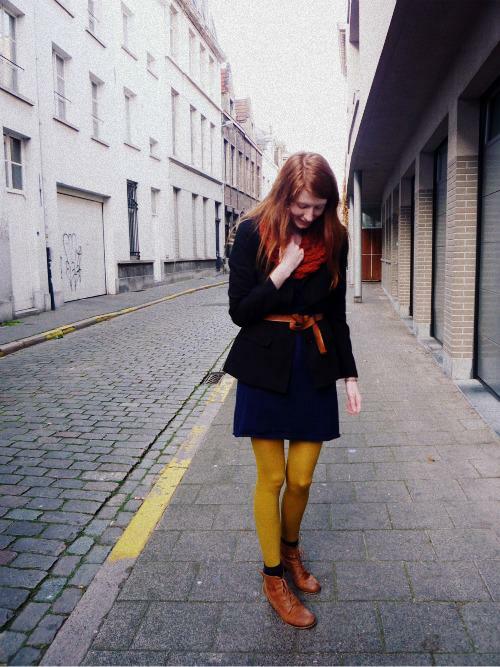 I've been dying for mustard yellow tights (and pants, and skirt, and sweater…)- obsessed with that color right now. Love your look! its a perfect combination. this combination of colors on you looks perfect. Well i love the mustard tights – though if I were in middle school I'd probably laugh too! I like the yellow tights! What was that girl laughing about. Kids are dumb. I enjoy how they look with the blue dress. 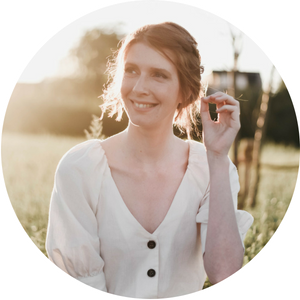 et HOP dans mes blogs favoris ! Cute!! I love your tights and shoes – and these colors look beautiful together 🙂 Happy Friday!!!! I for one love the yellow legs! Great choice 🙂 Plus, that cowl looks super cozy. i love these colors together! you're so adorable. Your scarf is such a pretty shade of burnt orange! 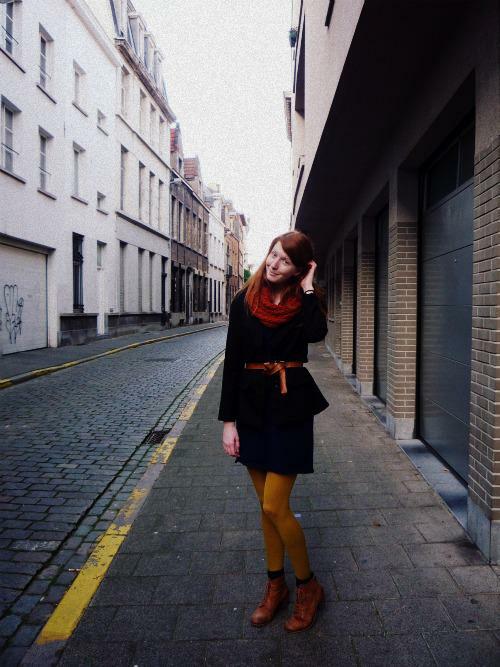 <3 And I love love love your mustard tights! I also hate it when actors and actresses branch out to write cookbooks and what not. They're not the experts so stop doing it! urgh, annoying! love the look sweet! !, I like your blog, I pass by your blog often. I invite you to visit me and follow me if you like. Aww I love your outfit! And your blog is adorable. 🙂 I'm a redhead too! Your color combination is brilliant and I like your yellow legs! 🙂 That girl probably doesn't have her own sense of style like you do!! This is the perfect outfit for a bookfair ♥ Keep rockin' those colorful stems! don't worry about the girl! i had girls laugh at me a few years ago when i started wearing oversized sunglasses! Such a cute look my dear! I love your tights and the name of your blog! That's one ADORABLE color combination! I love primary colors put together! And that girl is dumb, I would love yellow legs like that! They're darling! I love your boots too, the worn look they have is great. The book fair sure sounds like fun! Really pretty look, Love the way you've done the belt!